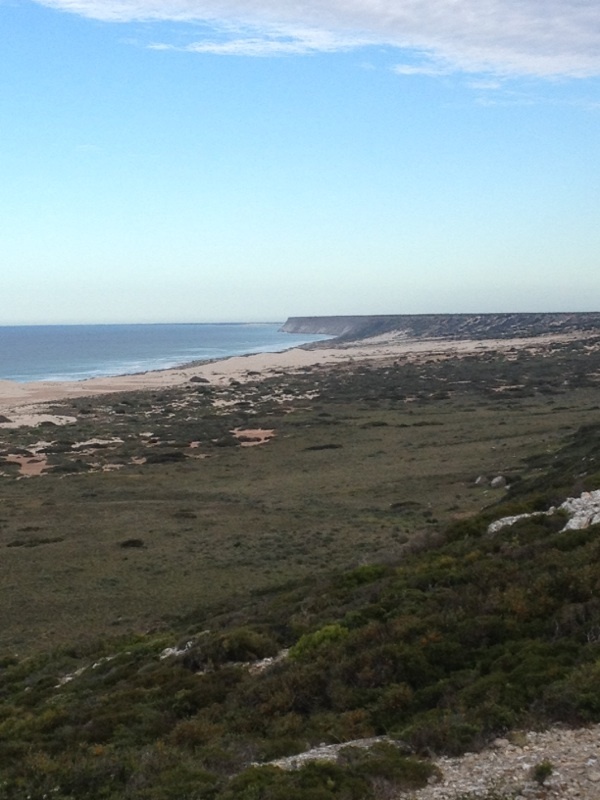 Border Village to somewhere on the Great Australian Bight. Roadhouse raisin toast and tea- the breakfast of champions or at least for this humble cyclist. 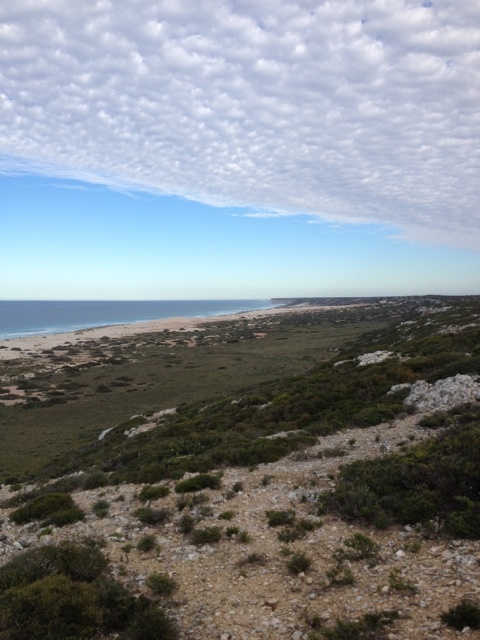 It’s 192 kilometers to Nullabor roadhouse so I planned to ride half that distance and wild camp. Before leaving Border Village yesterday, I had a brief chat with Terra, who is walking around Australia for the charity Lifeline ,amazing! The roadside verge is non existent in South Australia, so at times it’s necessary to pull off the road completely to let the road trains pass. 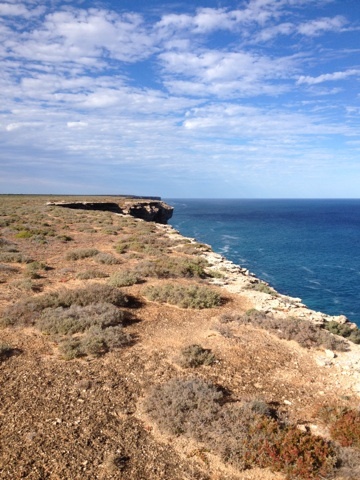 Thankfully this isn’t often and with the wind in my favour I make good time along the edge of Australia, stopping to take a couple of scenic pics while chatting to the caravan crew. 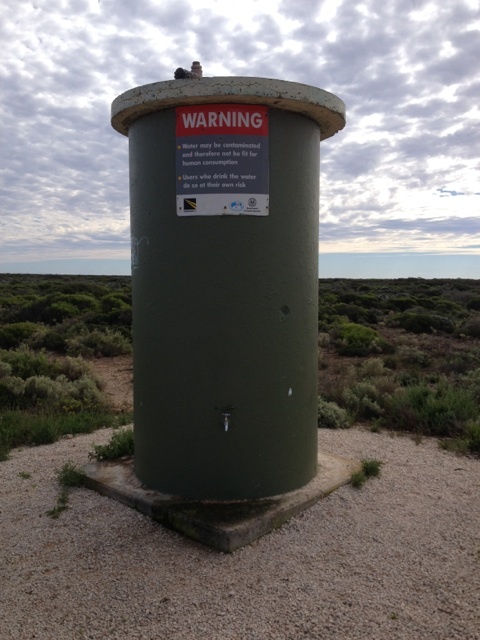 Around 50 kms into my ride I stop to load up at one of the only free water tanks along this section of the Nullarbor. ‘Drink at your own risk’ says the sign, I do and it tastes fine to me! Just after 85 kms into the ride I come to an off road rest stop. Rolling in for a break, I notice that somebody has left a perfectly good pair of boots at the table, not my size and too heavy to carry anyway. I don’t expect they will be feet less for long. Arriving at that point on the highway where I can turn off to a track that leads south towards the ocean, in search of buried cyclists treasure, I have to make a decision: Do I go on a treasure hunt or use the prevailing conditions to eat up the road? I chose to look for treasure ! I wasn’t able to ride the track, instead I had to wheel my bike for 2 kms until I came to what I thought was the T junction. Turning left for a further 4 kms near the edge of the cliffs, I got a little cut up and scratched as the track gave out in places. I seemed to have gone further than the 3 kms and it was getting late into the afternoon. Soon I would need to think about setting up camp. I questioned the merits of going further however, I had come this far. Scanning the horizon seeking out a sign, I’m sure I could make out the fence posts so I plodded on. Yes I could see them now, not much further. The sense of anticipation was beginning to build. 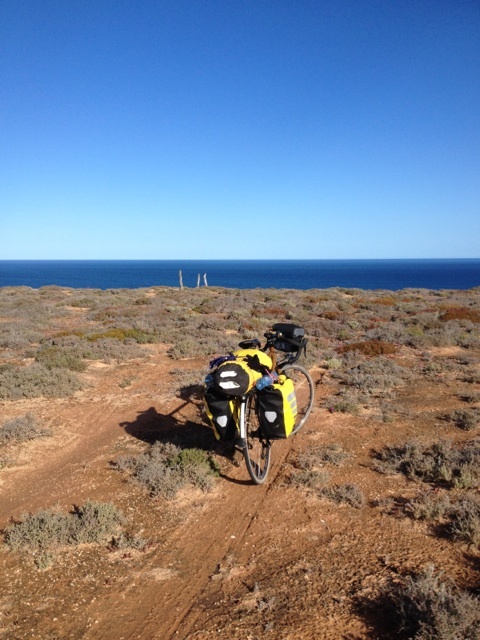 Would the famed ‘Nullarbor touring cyclist log’ be there full of cycling wisdom for those who seek the open road or am I on some wild wide eyed cyclists fantasy? Purple pig face was in bloom around the base of the fence posts, things didn’t look promising. 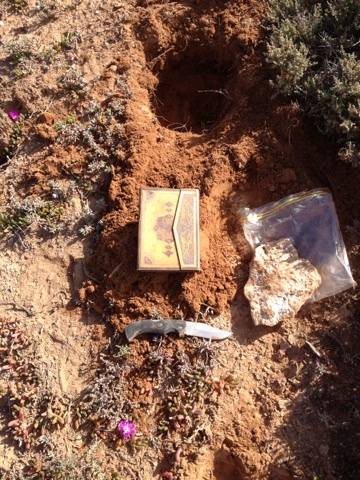 I started digging with my knife on the north side of the northernmost post about six inches down I struck pay dirt; I couldn’t believe it! After a couple of quick pics, I reverently opened the log to find this beautiful dedication. 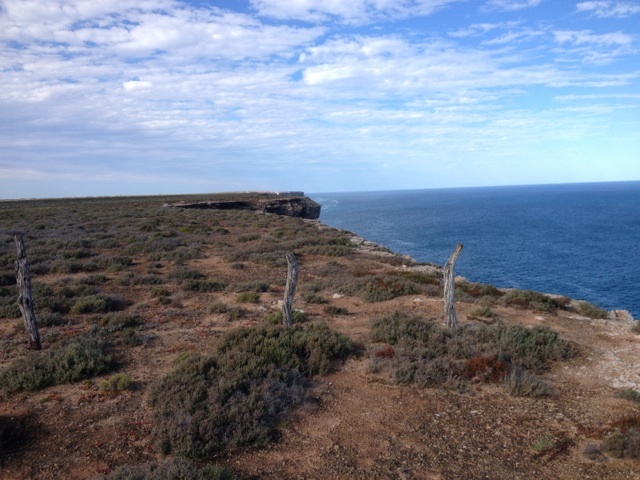 After reading the book, I pen a few comments of my own, then rebury the Nullarbor cyclists log, for the next intrepid cyclist to discover. 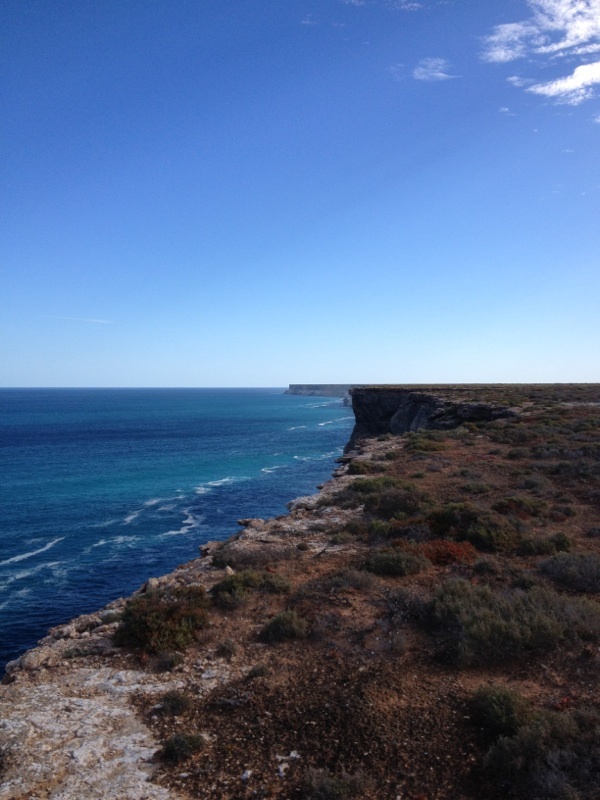 Wow, I was sure humbled and exhilarated all at once, out here on the edge of Australia, I looked upon the great expanse of ocean, gannets dived for their dinner. If you look at the sea long enough you will see mermaids. I think I saw whales, dark shapes moving offshore and waterspouts. Why didn’t I bring my binoculars! 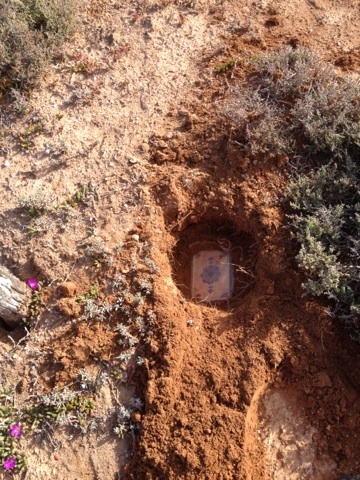 I found a little cover among the low scrub away from the cliffs edge to set up camp for tonight. Illuminated only by the stars above, the universe expands before me a kaleidoscope of colour and movement, of shooting stars and satellites, all to the rising sounds of the ocean throwing itself on the cliffs below. A spectacular light and sound show plays out before me. Cycling adventures don’t really come any better! I’m filled with an overwhelming sense of gratitude. Thankful beyond words . You made my day. Safe travels, my friend. Mike , I felt like Indiana Jones , digging up the log you so kindly left. A couple of days back I met up with a Japanese cyclist , Hero . I gave him directions to the log along with my copy of your notes , which I used as a guide on my crossing , thanks a million mate ! Nick – I love your story telling – God I wanted to cry when I read this one……..You are such a good wordsmith and you take the person there. Well done on finding this treasure as it surely turned out to be. Stay safe and well and keep on pedalling! Thanks Jan, I almost teared up myself getting there ! Reading all your posts with relish! Thanks for breaking waves and stars . . . makes me want to pack my bags and hit the road!